as sheep stroll home to hit the hay. Brief Synopsis: It’s time for bed, but the sheep are having a little trouble settling down. Fortunately a trusty collie knows just what to do to get them all happy and cozy for the night. Why I Like This Book: Delightful rhyme, a sweet, fun story, and adorable art – what’s not to love? 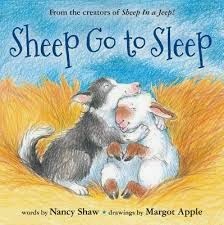 🙂 Just like a lot of children I know, the sheep hear some scary noises and feel a little too worried to fall asleep. Their friend the collie is as wise and understanding as any parent. He gives one a hug, one a drink, one a blanket until at last everyone is tucked in safe and cozy, sound asleep. And in the morning, when the sheep wake up, where do you think the collie has gone? (I’m not telling. You’ll have to read to find out :)) A lovely, comforting story (which incorporates some counting along the way for an added bonus :)) that is a perfect addition to any bedtime bookshelf.